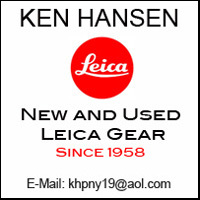 When it comes to Leica cameras, there appear to be two distinctly different camps, one of those who recognize what goes into a Leica camera and what makes it the superior cameras and lenses they are, the other of those who consider it nothing more than an overpriced piece of equipment, in no way better than ‘what I own’. I have researched the manufacture of cameras and lenses for quite some time. One of the factors that can make a camera a better performing piece of equipment is the precision that goes into it during manufacture. One such measure is the establishment and adherence of tolerances. The tighter the tolerances the more precise the camera will be. The average industry standard in this respect is 1/1000 inch with a few manufacturers going beyond that to 1/1250 inch and even 1/1700 inch. There is no camera manufacturer outside of Leica that demand tolerance not to be less than 1/2500 inch or 1/100 mm. As a matter of fact, the only other commercially produced camera with the same tolerances was the Zeiss Contarex which unfortunately was discontinued in the early 1970s. The same mechanical tolerances are being applied to lenses. Optical tolerances require to be much tighter with Leica applying tolerance as small as ¼ Lambda, meaning ¼ of the average wavelength of light. These are tolerances that are almost impossible to achieve with mass production, it requires a lot of hands on work, something that currently only Laica is doing. Unfortunately such attention to detail is expensive and it is this that is the primary reason for the often astonishingly high cost of Leica equipment. That isn’t to say that all other cameras are inferior by leaps and bounds. Definitely not, they often come close and it often requires considerable enlargements or cropping to make these differences visible. But differences there are. If they are worth the extra cost is something everyone has to decide themselves. Tomorrow I will publish a rather long article that goes into the manufacture and performance of photographic lenses in much detail and it will clarify to quite a degree what goes into the manufacture of Leica lenses. Some of the details might be quite astonishing and previously unknown to even the more sophisticated Leica owners. The Leica and cameras and photography in general certainly offer a lot of topics for discussion. But we must not forget the ultimate purpose of why we have cameras; to take pictures. For that reason I would like to start a weekly (or possibly daily) gallery of photographs. But I don’t want this to be a showcase for just my own work; to the contrary, I would like to encourage everyone to submit photographs for display on this blog. The copyright to the photographs will remain with the photographer and no pictures will ever be used for any other purpose unless permission is given by the copyright holder. If possible, please include the make and model of the camera (any camera, not just Leica) and any other information you deem important. It is my hope that this may become one of the most sought after topics of this blog.